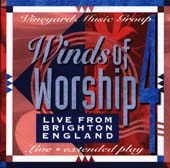 Live From Brighton, England: Vineyard Music EXTRA! Ive been listening to Vineyard albums for quite some time and Ive been genuinely impressed by the quality of these worship albums, especially the Winds of Worship albums. Brian Doerksen then takes over the set with new versions of his songs, Come And Fill Me Up, Light The Fire Again, and Remember Mercy. Come And Fill Me Up starts off simply with a few instruments and really takes off as the entire worship team joins in. I feel this is one of the best songs on the album. Light The Fire Again, unfortunately, is not as enjoyable as the original version of the song was, partly because I feel it was played a little fast and the guitar solo is replaced by an unsatisfying saxophone. Brian returns to form with a softer, more simple arrangement of Remember Mercy. The final three songs of the album (led by Carl Tuttle) are pleasing, but not very exciting versions of I Lift My Eyes Up, Holiness Unto Jesus, and My Jesus I Love Thee. I felt the pacing of the songs needed to picked up and I often just skip these last three. The hymn My Jesus, I Love Thee will appear on 2 more Winds of Worship albums. All in all, this album is a highly recommended album if you are looking for playable, appealing versions of these Vineyard songs. Ben Cheng <Ben.Cheng@centurion.flash.net> is a 26 year old worship leader at the Chinese Christian Alliance Church in Northridge, California, U.S.A.